This is a design I did earlier in the year using the Silly Farm exclusive Fairy Fly kits. Fairy Fly kits are one of the newest additions to the Silly Farm multi-colored cake collection. 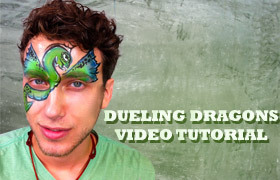 I created this dragon design on Andrew with a minimum amount of products. Below are the products I used, along with a link to the products on Silly Farm. This entry was posted in Videos & Tutorials and tagged boy, Design, dragon, Face Paint, Face Painting, fairy fly kit, Tutorial, video. Bookmark the permalink.